Recently, my wife and I have been making an effort to eat healthier and cleaner and in doing so we've been switching up our usual breakfast of various bars to something more filling and natural. 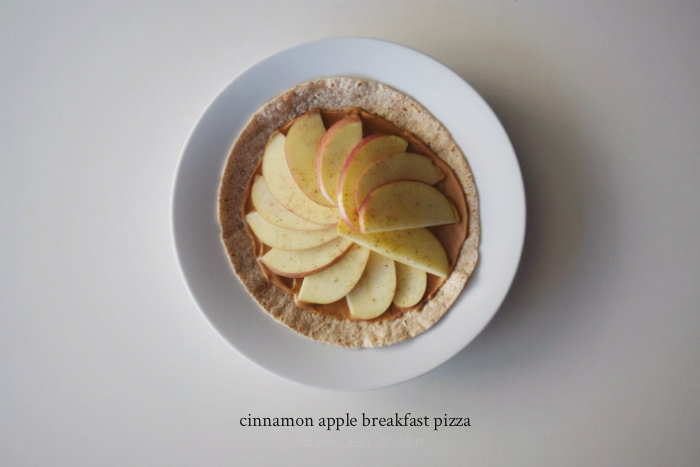 Among the rotation is a five minute breakfast we find ourselves coming back to more often than not... a cinnamon apple breakfast pizza. I'm honestly not sure where we saw the idea originally and attempting to search for it just now proved that we're not the only ones waking up to this in the morning, it seems to be everywhere and in several different variations; however, this is how we make it. On a flat tortilla, spread the peanut butter then layer the apple slices overlapping each other slightly until the entire tortilla is covered. (Note: We use one apple and we're able to cover two tortillas with slices leftover for our three year old's breakfast.) Sprinkle cinnamon on top, as much as desired. Done! Less than five minutes and breakfast is served. Good! Let me know how it turns out... we made it at least twice last week alone.